The legendary Kenny Roberts the 1st American to ever win the GP World Championship named a Grand Prix Legend in 2000 by the FIM, a rider who’s name can be mentioned in the same breath as Mike Hailwood, Valentino Rossi, Mick Doohan and Wayne Rainey. A 3 time 500cc World Champion winning the World championship on his 1st attempt having never seen most of the tracks before and even though he only had one bike for most of the season. Roberts was by profession a dirt tracker. He won the AMA Grand National championship twice, one of only four riders in American Motorcyclist Association (AMA) racing history to win the AMA Grand Slam, representing Grand National wins at a mile, half-mile, short-track, TT Steeplechase and road race events. His dirt track-based riding style changed the way Grand Prix motorcycles were ridden with his tail-sliding technique. A racer, team owner, constructor and safety advocate. 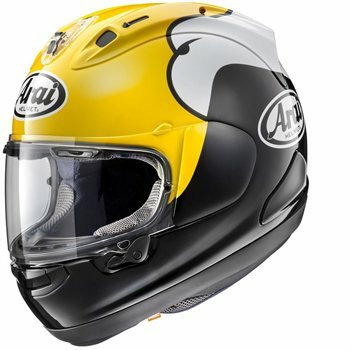 Get your little piece of history and honor the legend with this stunning Kenny Roberts replica helmet. The RX-7V represents the summit of Arai’s knowledge, experience and know-how in helmet technology. With a completely new PB-SNC2 outer shell, the revolutionary VAS (“Variable Axis System”) visor system and a significant increased smoother area around the temples, the RX-7V offers the new benchmark in the premium helmet segment. From the also new Eco Pure liner with an even slimmer frame, to the new ducts, improved diffuser and the integrated Air Channels, every part shows the attention to detail that is so typical for Arai. Arai has continually improved the “glancing off” performance by learning from real scenarios. Thanks to the new stronger and smoother shell and VAS, the RX-7V is closer to the ideal helmet shape than ever. New Shell Shape The new design continues to benefit from that focus and delivers Arai’s smoothest shell shape. The benefit is to improve glancing off ability. The new VAS sheild system lowers the visor holder (Side Pods), and therefor lowers the visor mechanism below the Snell Safety test line, allowing for a smoother shell and better impact performance. Having a larger, smoother shell over a wider area increases the ability to divert more energy. Ventilation The combined systems offer excellent and efficient ventilation. The new top duct provides 11% more airflow, with bigger switches for effortless operating. The Air Channel guides air from the eye port area to the side ducts. The new diffuser is 20 mm longer with improved aerodynamics, and 19% larger intake scoops, both work together with the Air Wing to improve stability. The chin cover blocks air intrusion and draws more air from the mouth area. More chin room The result of a newly design outer shell, there is now almost 3mm of extra face/chin room. New Shield Lock System Borrowed from our F1 helmet, completely modified 3D moving new shield lock mechanism secures the shield like never before, but operates smoothly with an intuitive fluid – one finger operation – even with gloves. New Shield System VAS: Variable Axis System allows the shield to travel in an arc, allowing a lower and more compact visor mechanism, not only improves helmet performance for rider protection but also allows easier shield changes with more intuitive design. New interior Thinner frame materials and redesigned frame connection points make the latest interior comfort head liner even more comfortable. Stress joints allow the liner to flex and even separate in necessary so as to not interfere with the helmets impact energy management properties/performance. New diffuser 20mm longer to increase airflow efficiency as well as improve high speed aerodynamics. Larger front intakes with intake shutters that better seal for a more aerodynamic effect when closed. Trailing sides of the diffuser body streamline airflow to improve stability, drag and wind noise. This helmet is awesome and fits like a glove. The quality is superb and I can get my glasses on easily. Pricey but you have to spend your money on something and I always was a Roberts fan. I am well happy. Buy it, wear it and enjoy it.